Winding through the forest, a busy trail overlooks the Cedar River watershed, Mount Si, Mount Washington, Rattlesnake River, and Chester Morse Lake. Built fifteen years ago to accommodate an estimated 40,000 hikers a year, the trail’s stunning panoramic views are now seen by almost 300,000 each year. This is Rattlesnake Ledge. The increased popularity of Rattlesnake Ledge has caused harm to the trail and to the nearby environment. 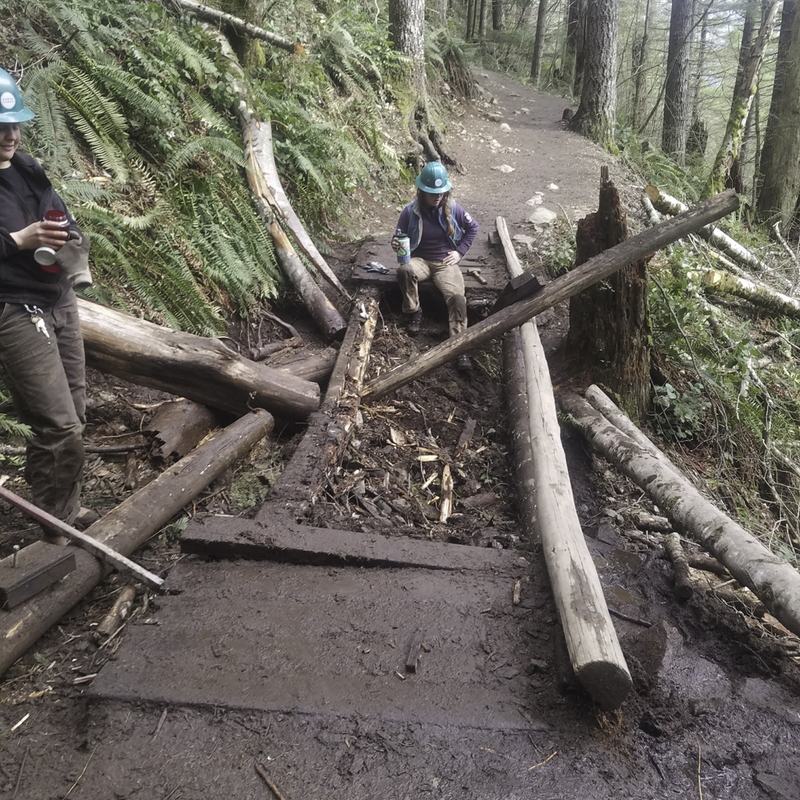 Similar to other trails that are heavily used, the landscape is facing erosion, switchbacks are being short-cut, wood structure are collapsing, social trails are becoming more prevalent causing hikers to walk off trail, and the trail head conditions are deteriorating. 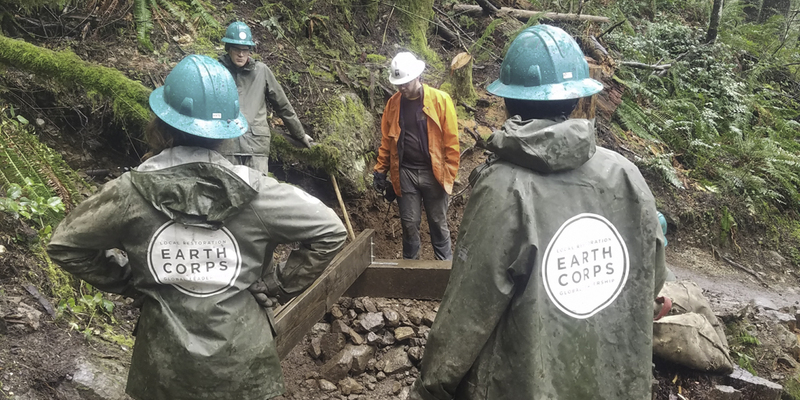 EarthCorps, The City of Seattle-Seattle Public Utilities (SPU), Mountains to Sound Greenway Trust, and Washington Trails Association (WTA) are restoring 2 miles of the iconic trail. Restoration of the site includes erosion control, reconstruction of wooden structures, and overall improvements to the user experience. 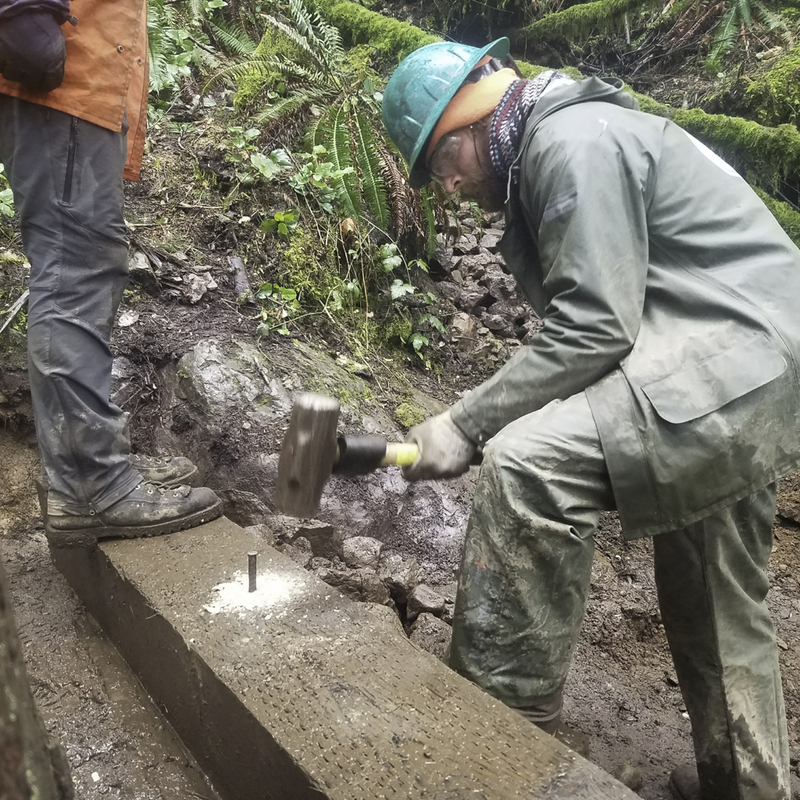 Corps members have already begun constructing two small trail bridges. Next they will build rock retention walls, and begin to add surface to areas lower on the trail. Because Rattlesnake Ledge is close to the Seattle metropolitan area it will continue to remain an accessible destination for hikers of all abilities. Corps members take a much deserved water break as they are decommissioning the bridge at the upper section of the trail. 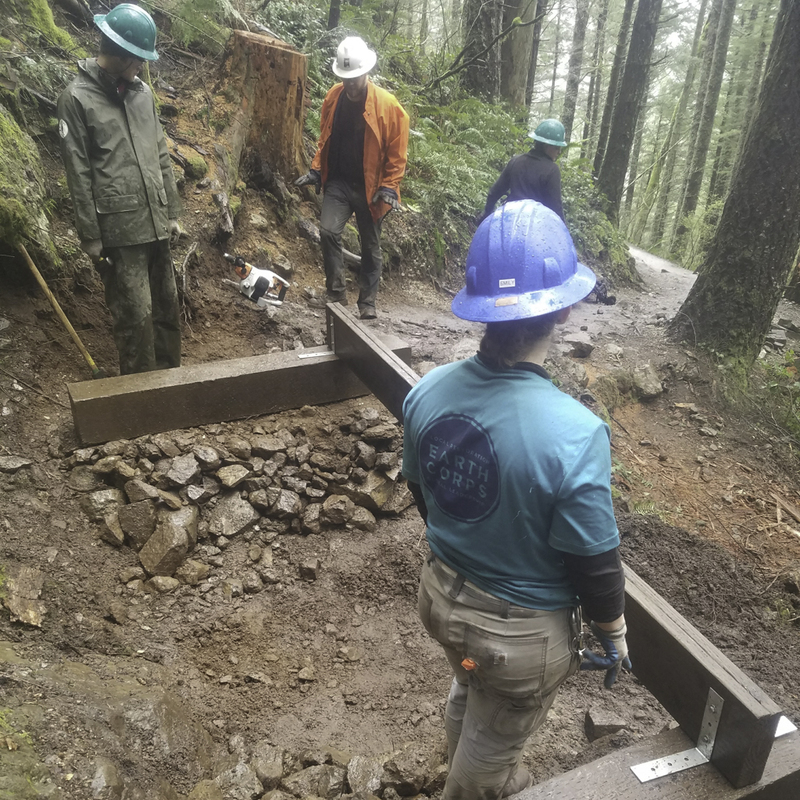 Before finalizing the placement of the bridge on the lower section of the trail, the crew double checks measurements to make sure everything is properly placed. Corps member Josh, uses a sledge hammer and rebar to reinforce the base of the bridge into the ground. 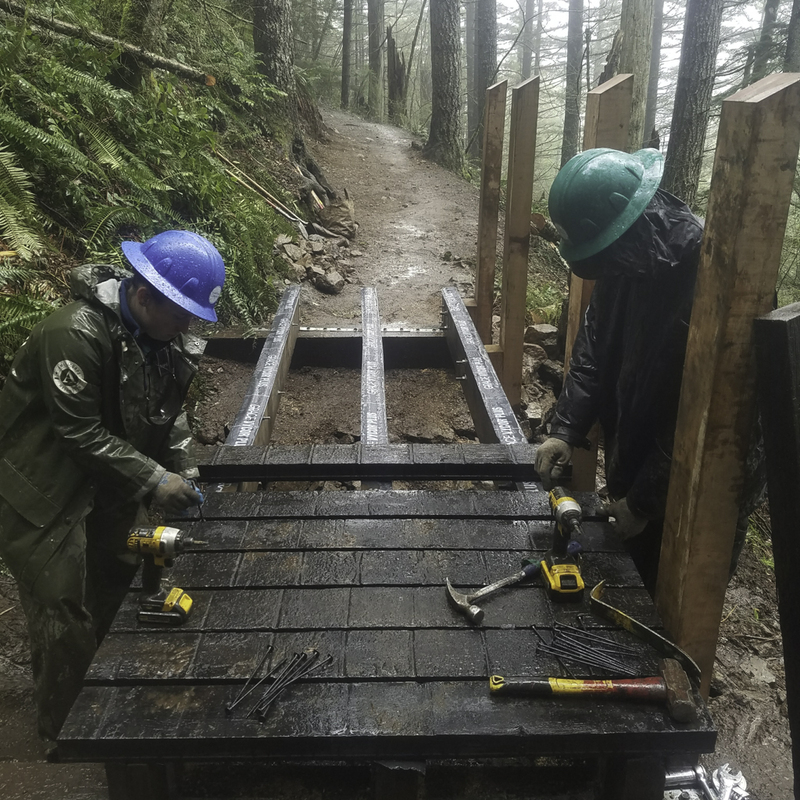 The crew installs durable planks on the bridge for the 300,000 hikers who will use the bridge each year.